Donate TODAY - Give Miami Day! indicate which academy or advisory board - in the question "This gift is..."
select "in honor of" or "referred by". Your donation of $25 will sponsor one student to attend the 2018 Miami NAF Mega Student Industry Conference, $100 donation will sponsor 4 students, $250 donation will pay for transportation of 40 students! 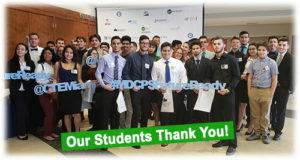 You can make an impact on our community by donating to support students from 59 NAF Academies at 30 Miami-Dade high schools.